The road from Tupiza to Uyuni was definitely a journey to remember, and not of the bad kind. It is only just over 200km, but took six hours. This was mainly down to the fact that there are no roads as such, and most of the journey was winding through valleys, canyons and hills. It was a spectacular end to our stay in Tupiza, and yet another great experience that Bolivia has brought us. Uyuni is one of the most popular towns for tourists in Bolivia. This isn’t because it’s a nice place to visit (which it isn’t particularly), it’s because it’s the main point for visiting the Salar de Uyuni (the Uyuni salt flats). We had originally planned to take the trip from Tupiza, but it was difficult to tie in crossing the border to Chile from there. So instead, after searching long and hard through the hundreds of tour agencies, we found a tour that came highly recommended and had a lot of activities that weren’t included in the normal tours. We were joined on our tour by some friends we met in Colombia, Matt and Kristin from Texas. They are doing a slightly different route to us, but we managed to arrange it so that we crossed paths again. When we arrived at the bus station we were met by our guide, Jose. There was some concern as Matt and Kristin hadn’t checked in with the agency, and we had received no emails from them. After an hour or so, and some frantic emails, we bumped into them on the main plaza, and it turns out we were staying in the same hotel, and had been waiting at the bus station with a little welcome sign. The night turned into a wine drenched evening of catching up and cards. We had bought some supplies of wine to take on the salt flat tour with us, but the supplies were severely diminished by the end of the night. The next morning we were all moving slightly slower than usual, but excited about starting our trip. The first stop was a train cemetery. It’s a bit of a strange thing to find in the middle of the desert, but there were steam trains dating back to the 1880s. Uyuni used to be the place where trains would be brought for repair, but now they are just abandoned and begging for the attention of gringo’s cameras. There are lots of tours that do very similar routes, and it feels like a bit of a conveyor belt. So we left quite quickly to try and get ahead of the pack. This didn’t really help though as when we arrived at our next stop, the salt mines; there were already dozens of 4x4s already there. As it was a Sunday there were no workers around, but we had a quick tour and Jose explained how they turn the raw material from the flats into salt fit for the table. All of this salt is mined from the salt flats, which we were introduced to next. Salar de Uyuni is the world’s largest salt flat at 10,582 km², and it’s an impressive sight. Set against a clear blue sky, it looks like a giant ice rink, and even sounds like snow when walking on it. All of the other tours give you a couple of minutes to walk around and take pictures before loading you back into the 4x4s and driving you to lunch. We however were given bikes so we could ride around on the flats, and make our own way to lunch. The ride was probably about 5km at most, and the sun was helping us keep warm. Unfortunately a little too warm as that evening we were all very pink. After lunch of llama steak served in a salt hotel (something you don’t get to do every day), we drove to a very remote area of the flats to take some funny perspective pictures. There are no reference points around you, so it’s the perfect place to do it. Jose asked us to come up with some ideas the previous day, but we weren’t really inspired. Thankfully he had some great ideas, and helped us with ideas and getting into position. Some of the photos were really effective and others not so much. But we had a great time messing around on the flats, and even had time for some frisbee. When we eventually dragged ourselves away we visited Incahuasi Island in the centre of the salt flats. It is covered in huge cacti, and makes a very bizarre landscape against the backdrop of the salt flats. Some of the cacti are over 9m tall and 900 years old. Another island we went to visit had a huge cave where we escaped from the sun. The islands are the remains of volcanos that weren’t covered when the flats were formed by the uprising of the Andes. It had been a long day, but we weren’t finished yet. On the way back to our hotel for the night, we stopped to get some pictures of the sunset. Jose told us that we must get a picture of us jumping in front of the sun, and we were a bit sceptical. We don’t usually take these cheesy type of pictures, but we were quite shocked at how good it looked. After a very dodgy dinner of pique macho (one of Bolivia’s national dishes), we had barely gotten through our first bottle of wine before Jose was back. He took us out in the freezing cold of night to the centre of the flats to look at the stars. When we first got out of the jeep I was shocked. Back in the UK you don’t really get any decent views of the stars due to all of the city lights. This was totally different though. There were so many stars, and you could see the Milky Way really clearly. We just lay on the floor, enjoyed the rest of our wine and just took it all in. We saw loads of shooting stars, and it was a great end of a really good day. We had been warned that the flats were really cold at night, but our hotel wasn’t cold at all. We had a good night’s sleep, and the next day we were primed and ready for more. Our first stop was a lookout over a volcano. We had expected to walk up to the crater, so we were slightly disappointed when we found that we were over 1km away from it. The rest of the day we saw lakes of various different colours. All of the lakes had flamingos…and lots of them. After slowly made our way to just less than 5000m above sea level before we arrived at our hotel for the night. It had already started to get pretty cold, but as soon as the sun went down it dropped even more. So we layered up with as much alpaca as we could find, and enjoyed playing cards with Jose whilst enjoying some more wine. We had a fairly early night as the next morning we were up at 04:00am to go and see the sun rise. I think we have said before that we much prefer sunsets to sunrises, but this was a sunrise with a difference. First on the agenda was a visit to the geysers. It was bitterly cold at that time of the morning, and Katy blankly refused to get out of the jeep. Matt, Kristin and I walked around them for as long as we could, before the cold got too much for us. We got back in the jeep and headed for our next stop, a dip in some hot springs. This involved stripping down to our bathing suits (don’t worry, we weren’t naked) and jumping in the small natural pool that was about 35°. Everybody was a bit hesitant as it was so cold, so I decided to take the lead. After just a short jog to the pool it was a relief to get in. The problem was getting out and getting dry. There were no toilets or changing rooms, so it involved holding a towel around each other and trying not to get frostbite in the process. While all this was going on Jose had prepared breakfast for us, a hot drink and some food was perfect for warming us up. The last part of our trip was our transfer to the Chile border. Matt and Kristin still had a few weeks left in Bolivia, so we said our emotional goodbyes before they headed back to Uyuni. We on the other hand were left in the middle of the desert waiting for our bus. It was absolutely freezing (around -10°) and we were stuck there for an hour. Let’s just say that we were not happy. We were there with two Australian couples, Matt & Allie and Leo & Catherine. Once the bus had driven us to San Pedro in Chile, we all got off for the border control. We had been warned that it could take up to two hours to get through, but it was actually a really quick process. Just as our sprits started to lift, we were greeted with some bad news. It was Independence Day in Chile, and virtually everything was booked out. To make things worse, none of the cash points were working with our bank cards, so we couldn’t even get any money out. We had absolutely no money on us, so it looked like another fine start to a new country. Thankfully after speaking to a few tour agents, we managed to find a hostel that had spare beds. 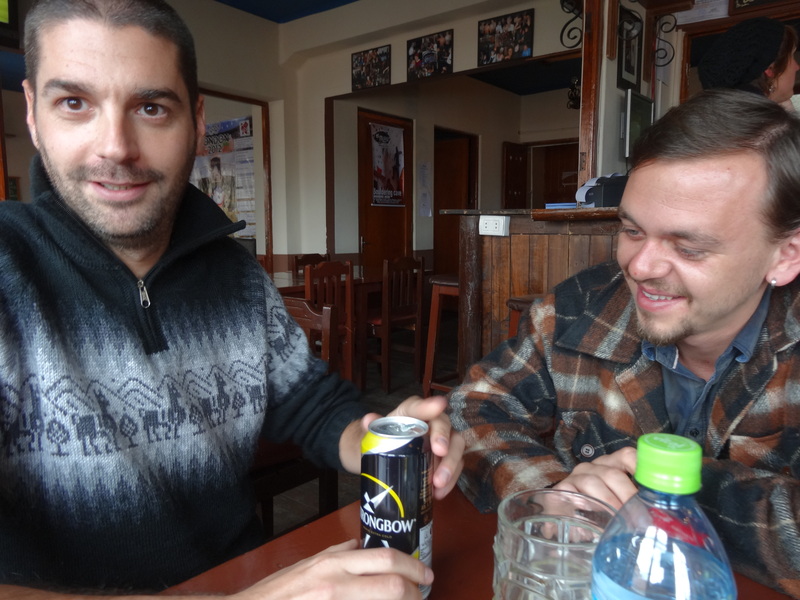 We also borrowed some money from our new Aussie friends, so we could finally start to relax…or so we thought. The next step was to work out how to get to Santiago. We knew it was a 24 hour bus trip, but because of the Independence Day celebrations all of the buses were booked out. Our next option was to check hire cars, but they were also all booked out. The final option was to get a flight. After searching for an hour or so, Katy managed to find a reasonable for $130 (only $20 more than the bus). Unfortunately they didn’t accept online booking with foreign credit cards. So instead we got chatting to a local couple that were staying in our hostel; Francisco and Penelope. Francisco kindly offered to try and help us by phoning the company and paying over the phone. After almost an hour on the phone, we finally had our flight booked, and decided to celebrate with a few drinks with our new Chilean friends. This turned into a few more, and eventually they persuaded us to join them to a party in the town. There was a live Chilean Hip-Hop band that were really good, and we stood around a bonfire with a few beers and getting to know each other a bit better. Katy and I were the last ones standing, and we didn’t get back to our hostel until 04:30am. We had been up 24 hours, not eaten dinner and had drunk far too much rum and beer. This morning we were both suffering, and we have struggled to do anything all day. We had a minor emergency when our flights had to be re-booked for more money, but it was all sorted in the end. We’re just about to enjoy a BBQ tonight, and hopefully we can begin to enjoy Chile without any more dramas. We were a bit sad to leave Bolivia as we had really enjoyed our time there. There are so many different things to do, and it’s such a diverse country. I would definitely recommend it to anyone, and hopefully our last few stops will be as good as Bolivia. We arrived to Bolivia’s capital early in the morning and were luckily shown straight to our room at the hostel we’d booked and offered breakfast…good start. Sucre was a nice surprise with clear blue skies every day, beautiful buildings to look at and a fairly lively night life. We had booked two nights but ended up staying seven. We had good intentions of finding somewhere cheaper to stay but our hostel (Case Verde) was so good that I managed to persuade Sam to stay. When you get an amazing breakfast, a swimming pool and a fully equipped kitchen to use for only £19 per night who’d want to leave all that to save a few quid? Anyway by extending our stay to seven nights it meant that we got a discount…bonus! There is not much to say about Sucre as we didn’t do much at all. Our days were spent reading, swimming, cooking and drinking local red wine. We took advantage of the kitchen and cooked every night…well I cooked every night while Sam watched. We enjoyed lots of local red wine which was actually pretty decent and only £2 a bottle. Or it could be that it’s been such a long time since I have had any decent wine that any wine now tastes good to me! We made a few friends whilst there and even dragged ourselves away from the hostel for a night out. It was really good fun and included several bars, a club, and we ended the night in a local karaoke bar. At 4:30am we realised that bed was a better idea than singing an Islands In The Stream duet, and so we headed home. Needless to say we felt pretty rubbish the next day and didn’t move from the comfort of our hostel. It was a much needed cheap and relaxing week but it was time to move on so we reluctantly bought our bus tickets to Potosi. 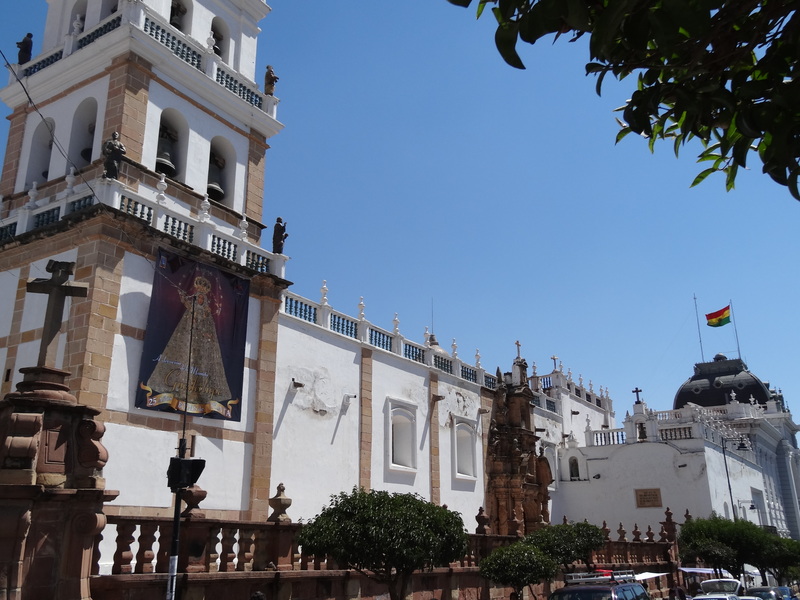 According to the Lonely Planet, Potosi is the highest city in the world at 4070m above sea level. Not true. Sam was determined to prove LP wrong, and after some searching it turns out that there are several higher cities, the highest one being in Peru. We’d been warned that it was very cold there and that the altitude made even walking up a small hill very difficult. However, when we arrived it was lovely and sunny and perhaps because we’ve become acclimatised to the altitude, we didn’t really notice the thin air. Potosi was once the richest city in the world due to the local silver mines, and the centre of town was very pretty with some impressive buildings. The silver mines are still open and one of the things you can do here is take a tour and go into the mines. We had met a lot of people who had done the tour and said it was amazing and others who had refused to do the tour because it was dangerous and quite harrowing. Even as we were getting ourselves kitted out in miners gear, I still didn’t know if I wanted to do it. Hearing all of the stories from people who had already visited the mines was not really enough to prepare me for the experience. Upon entering the mine (and waving goodbye to Katy), the temperature dropped to near freezing. The tunnel also got much narrower and the ceiling much lower. Walking through one foot of water in the pitch black, we were then told to watch out for the trolleys exiting the mine. They would be carrying up to two tons of material, and could be very dangerous. I didn’t really see how I could get out of the way as the tunnels were so narrow at that point, but thankfully soon after they opened up a bit. As we ventured deeper into the mine, it got much hotter. Wearing a scarf over my mouth didn’t help, but this was essential. There are numerous noxious chemicals present in the mine including asbestos, mercury, arsenic, phosphorous and silica dust. Most miners die of silicosis pneumonia within ten years of beginning work in the mines, so I didn’t fancy taking my chances. Since the mine opened in 1546, over 8 million people have died there. As we got deeper into the mine, we met some of the miners at work. Most start work at around 04:00am, and work until 17:00pm. We sat with two miners just as they we about to get back to work after having a break. Coca leaves is an essential part of work there, as food isn’t generally consumed in the mine due to the chemicals in the air. Instead they chew coca leaves mixed with ash, which suppresses hunger and gives them the energy to keep on working. They told us about how miners used to spend six months down the mines at a time, and that they worship their devil (Tiá) as God doesn’t exist down there. 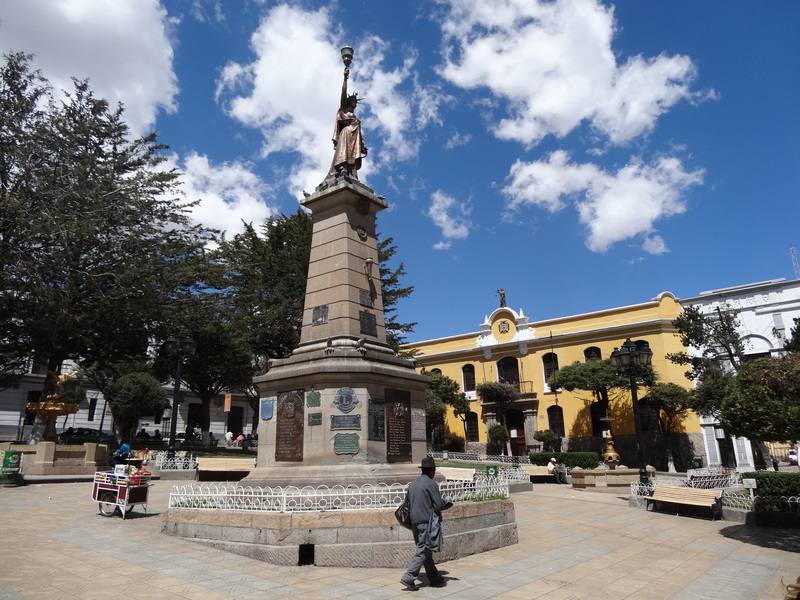 There are several statues of Tiá where the miners can provide offerings including alpaca foetuses, cigarettes, alcohol and coca leaves. 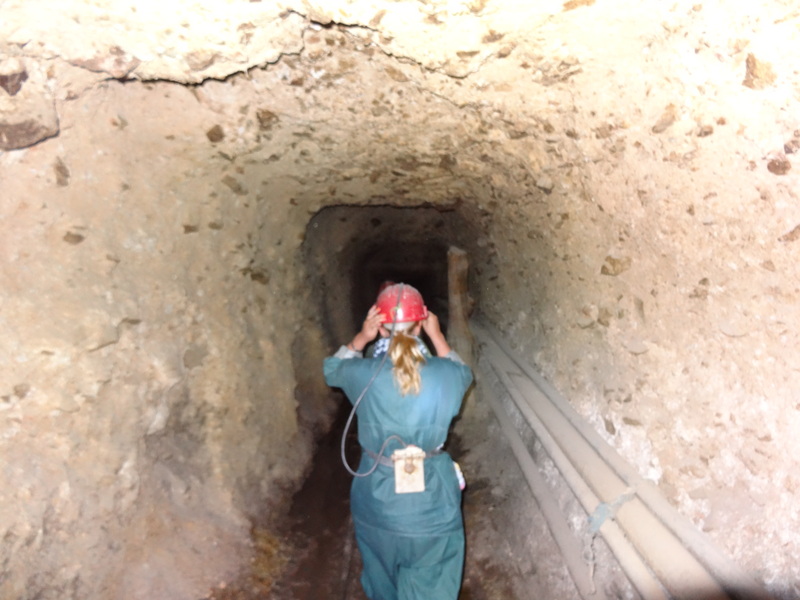 Some parts of the mine were very claustrophobic, and involved crawling through very tight spaces. It was probably a good job that Katy didn’t go any further in. If she freaked out at 30m in, then it could have only have been worse a 3km in with temperatures at around 45°. We were in there for about one and a half hours, and it was an experience that will be hard to forget. It also makes our normal working lives seem much more bearable, even after not working for almost a year. We’re now in Tupiza, a small town in the very south of Bolivia and also known as the wild west of South America due to its amazing landscape of rainbow coloured rocks, hills and canyons. Even at 2950m above sea level it’s very hot so naturally we booked another hostel with a swimming pool. I managed to persuade Sam to get back in the saddle and what better place to do it. We went out for three hours and cantered along the dry river, stopped at a canyon for a quick break and I had great fun watching Sam bob up and down on his horse. I think three hours was enough for both of us as it was really hot and Sam was soon feeling the pain. He did very well again and even had a mini gallop at one stage…definitely not intentional but once one horse goes they all go. It was a great morning and we had hoped the afternoon would be spent around the pool but unfortunately it had clouded over and then we had a big thunder storm. Instead we settled for a late lunch of local empanadas with a peanut chilli sauce, which were delicious…think Cornish pasty but much nicer. It’s been a great place to relax and enjoy some sun, and yet another very different place to add to Bolivia’s long list. 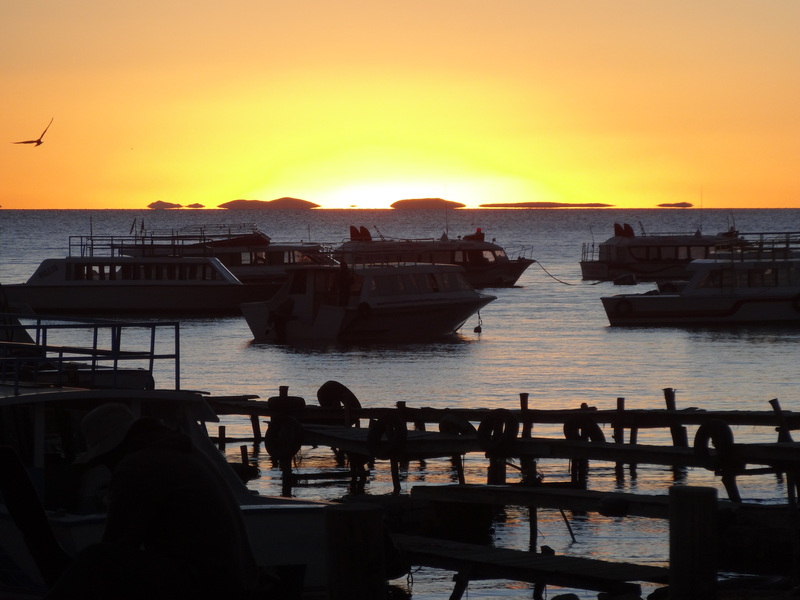 Our time in Bolivia started with a visit to Copacabana and Lake Titicaca. 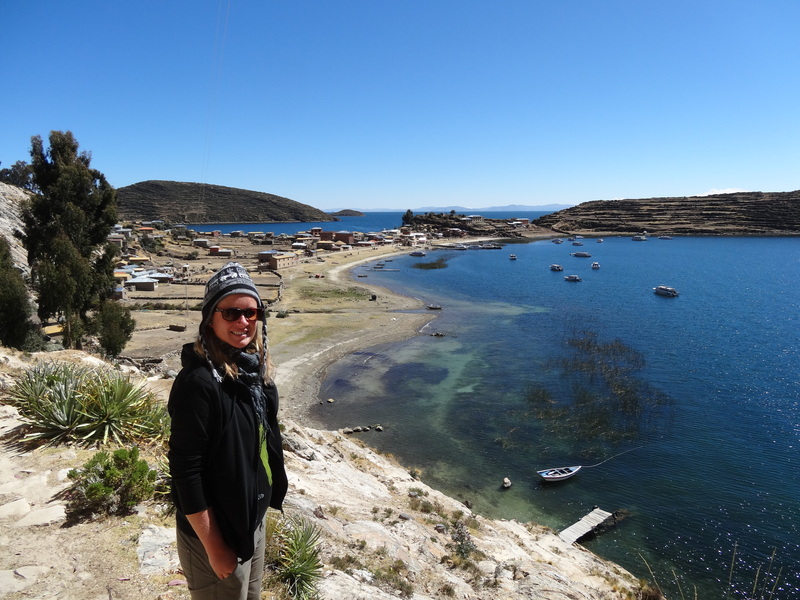 We had heard really good things about the place from people we had met in Cusco, especially one of the islands on the lake called Isla Del Sol. The lake itself is the largest in South America, and it separates Peru from Bolivia. The border crossing was simple enough, although there were a few Americans on the bus that had a harder time getting across than us, with one girl even getting refused. We had an afternoon recovering from our overnight journey and relaxing in the sun before meeting some friends from Peru (Jo and Tommy) for dinner. We went to a great restaurant that I would highly recommend called La Orilla. A good fillet steak or amazing fresh water trout with a glass of wine for under £5 can’t be bad, and a great way to welcome in a new country. The next morning we got up early to get a boat to the north of Isla Del Sol, which took about three hours. Thankfully it was a nice day, so we took in the sights before arriving at the tiny port. Most people on the boat were booked on as part of a tour, but we had decided that we would explore the island on our own. We knew a rough route to take us down to the port in the south of the island, and we knew we had a maximum of about four hours to walk it. We saw loads of animals along the way as most of the land is used for farming, and we even had a dog for company for the first couple of miles of the walk. The walk itself had some stunning views over the lake with the snow-capped Andes in the background. It was a hot day, and at over 3800m above sea level some of the hills seemed more like mountains. We had a quick break in the middle of a farm where in our best broken Spanish we asked for directions. When we were pointed up one of the bigger hills of the island, Katy didn’t seem too happy, and we soon found ourselves having another break. Forty minutes later we stumbled across another farmer who told us we had been going in the completely wrong direction, but for a small fee he could get us back on track. By this point Katy wasn’t in the mood for bartering and just told me to pay the man. We got back to the south port in plenty of time though, and thoroughly enjoyed our day on the lake. We only had two nights in Copacabana before heading to La Paz. It’s a very busy city, and a stark contrast to our last few weeks. It’s a bit of a strange city as it’s a big, but with very little to do. We struggled to find restaurants at one stage, and it wasn’t really what we expected. We did get to meet up with an old friend that we met in our first week of travelling in Beijing, Slaven. Since Beijing we also bumped into him on a desert island in Cambodia, and it was nice to catch up again after so long. We enjoyed a few drinks and a full English breakfast whilst watching some of the Sunday morning football. La Paz is famous for its markets, and specifically anything related to alpaca. I thought we had actually bought enough alpaca clothing to last us a lifetime, but Katy was adamant that we needed more…constantly reminding me that parts of Bolivia get as cold as -15° at night. The markets also sell alpaca foetuses that local witches use to cook up potions and spells. Funnily enough though, Katy wasn’t interested in buying any of those as souvenirs. Before we left La Paz, we went to check out the local attraction that is held every Sunday. Cholitas is local wrestling, where women in traditional clothes take on the men. Not really being a fan of wrestling I didn’t really know what to expect, but it was a surprising evening. We took Slaven along with us, and not long after taking our seats in the front row were we covered in drinks being thrown out of the ring. At one point one of our fellow gringos was dragged into the ring, and I was just relived that it wasn’t me. It was all very cheesy, but a great night out none the less. Next on the agenda was the Amazon jungle. We had been thinking about doing a jungle trip in Bolivia for some time, as it is supposed to be the cheapest place to do it. It wasn’t until we got to La Paz though that it was all booked and confirmed. We decided to go with a cheap return flight with a company that is run by the Bolivian military, called TAM. Katy isn’t the best flyer in the world and flying usually involves her squeezing all the blood out of my hand during take-off. This flight however was very different, with almost a full panic attack taking place. It didn’t help that the plane was about fifty years old, only held about forty people and was held together with duct tape (no joke). The main problem however was that after take-off we were flying perilously close to the surrounding mountains. Eventually though things calmed down and the panic attack was over, and forty minutes later we landed in Rurrenabaque. The first night was much colder than we expected, and we went out for drinks and dinner with another couple from England we met on the flight, Zoe and JK. 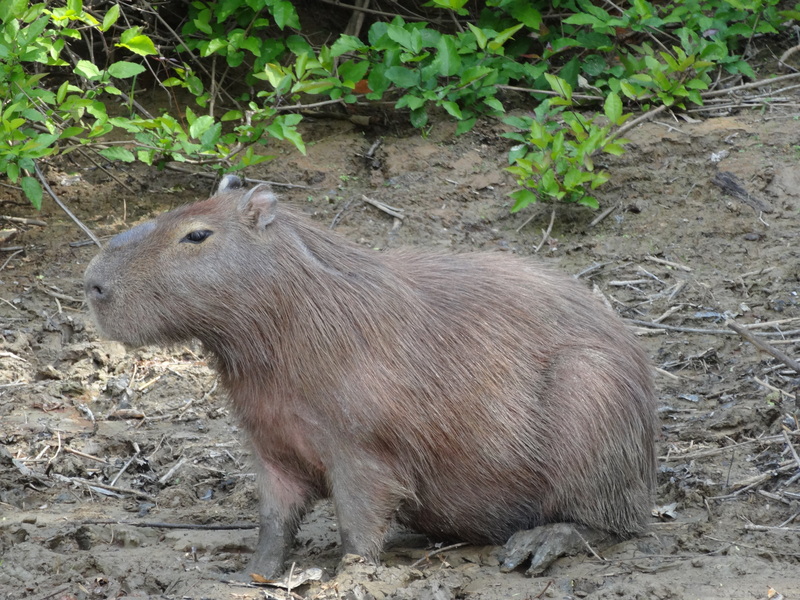 There are several tours you can do from here, but we decided to go with the Pampas tour which involved more animals and less trekking…much to Katy’s delight. Our tour left early the next morning and we were joined for the very bumpy ride by four Aussies, Jess and Leigh and Kate and Andy. It was a three hour jeep ride to Santa Rosa, and we were all relieved to get out and stretch our legs before having lunch. Soon after we were on the road again, and we then made our way to the Beni River for the next leg of our trip; a three hour trip on a motorised canoe. Our guide, Juan, pointed out some of the many different types of wildlife on the way while we got to know each better and all wishing we had bought along a cerveza or two. The lodge we stayed in was rickety to say the least, and we were staying in a dorm that looked like it hadn’t been cleaned in a few weeks. After dinner and a cold shower, we then headed up river to spot alligators and caimans. Our torches lit up their eyes in the dark, and it was a bit unnerving seeing so many of them so close to the boat. When we headed back to camp, we made a quick pit stop in a river bar (if you can call it that) to pick up some wine. The camp only had power until 10:00pm, so we had a couple of hour playing cards and learning how much Aussies cheat. The next day we headed out into the marsh lands looking for anacondas. The weather had got much hotter since the previous day, and it finally began to feel like we were in the jungle. 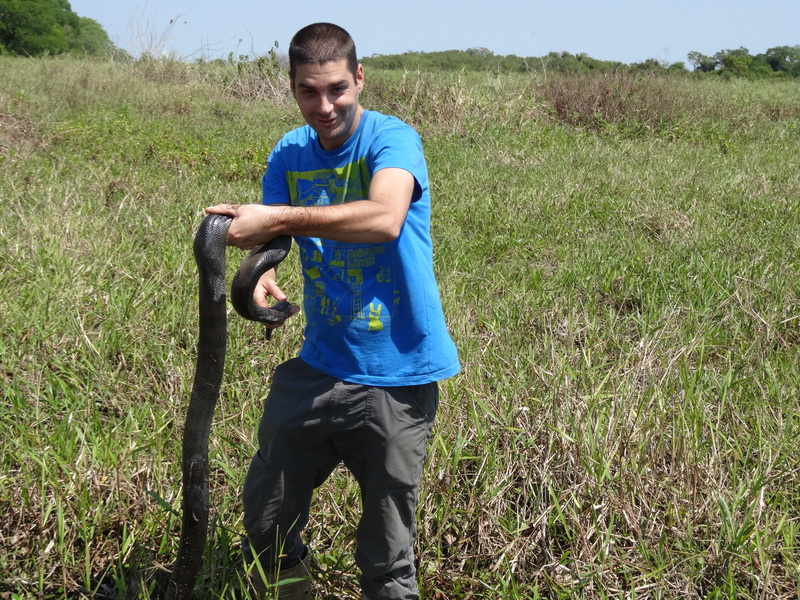 Our guide, Juan told us that two weeks before he had found a seven metre anaconda not far from where we were. As we were up to our knees in swamp it was making a few of the girls a bit nervous, so after a couple of hours of searching they gave up and started playing cards under a tree, leaving the boys to do the searching. Ten minutes later we found one. It wasn’t quite seven metres long, but it was good to finally see one after searching for so long. On our way back to the boat Katy suddenly screamed and began jumping up and down and flapping her arms. I looked around to see dozens of wasps surrounding her and decided the best thing to do was run (obviously telling Katy to do the same thing). It turns out she had walked straight through a wasp’s nest and ended up being stung about six times. Not a very happy Katy afterwards, until we smothered her wounds with tomato sauce to ease the pain. 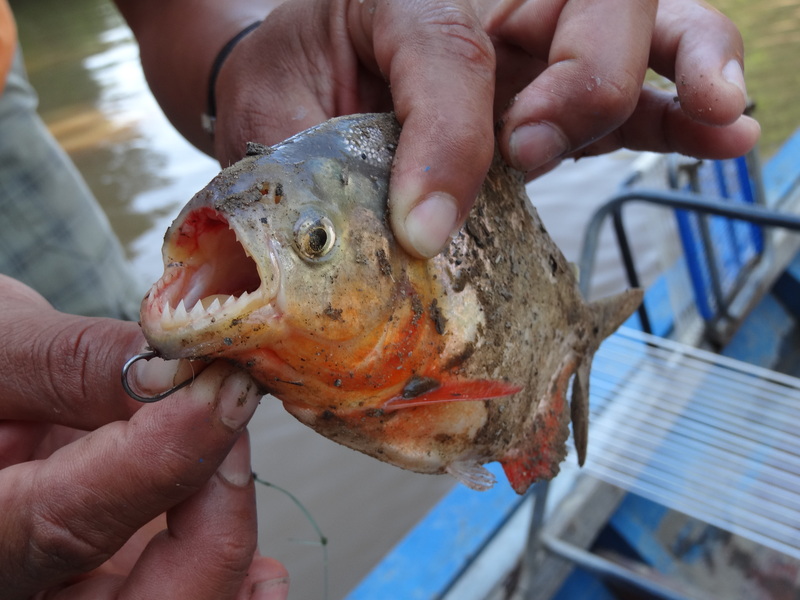 That afternoon we went piranha fishing in a quiet area upstream. First of all we caught some sardines as bait, and then we went for the piranhas. Katy did well and had one of the bigger catches of the day, perfect for our dinner later on that evening. On the way back to camp we headed back to the river bar where a game of football had been organised by some Irish lads on one of the other tours. We spent an hour or so running around beer in hand, trying to avoid all of the mosquitoes. It ended with the guides, English and Aussies beating the rest of the world 6-5. The next morning we were supposed to be up at 05:00am to go and see the sunrise, but the previous night after quite a few bottles of red wine we all decided that we would rather have a lie in. Instead after breakfast we went to swim with dolphins (among other things) in the river. 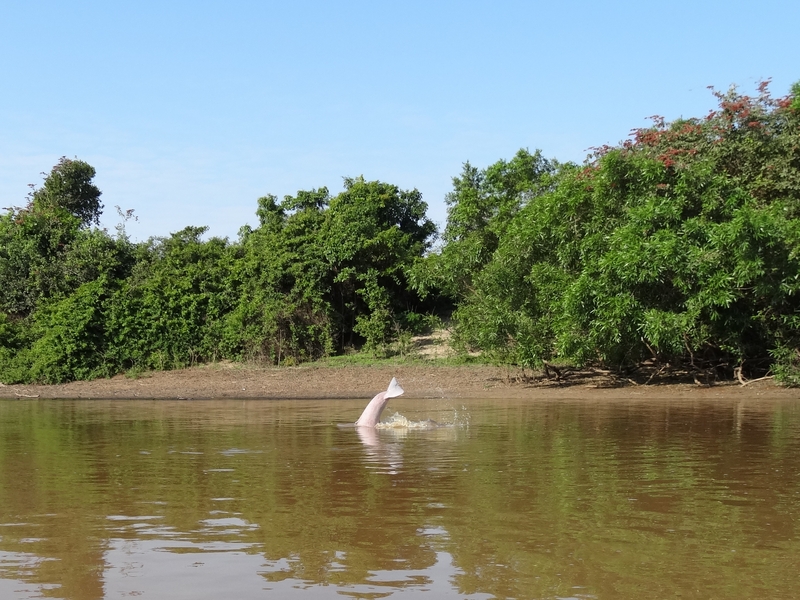 After seeing people fishing for piranhas just metres away, and a host of alligators and caimans sat on the river banks, we were all a bit nervous. Juan ensured us though that the dolphins would protect us. I’m not too sure how true this is, but either way it got us into the water. That afternoon we had the long journey back to Rurrenabaque. 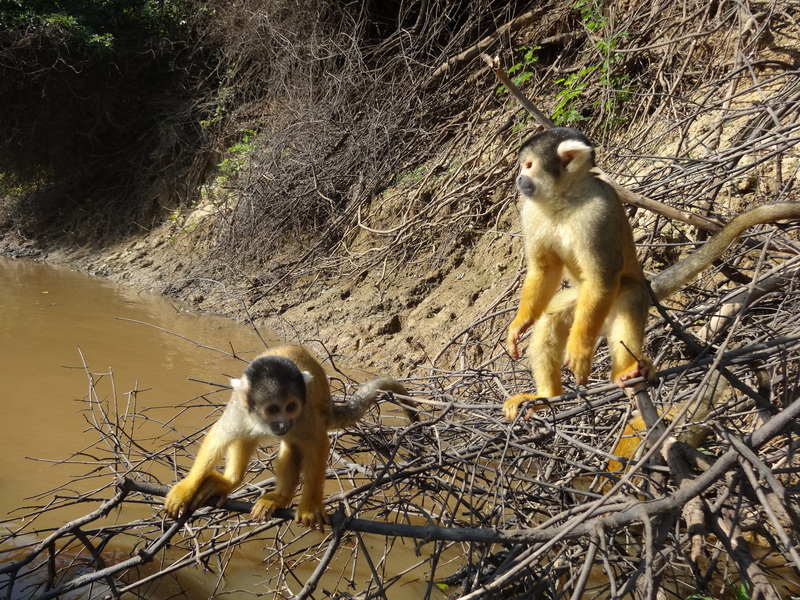 It had been an amazing few days in the jungle where we saw parrots, howler monkeys, black caimans, alligators, anacondas, piranhas, pink river dolphins, macaws, eagles, vultures, hoatzins, parrots, cassowarys, rhinoceros beetles, spider monkeys, capybaras and vampire bats. Unfortunately we didn’t see any sloths or tapirs, but we were both very happy with the trip. That night we all met in the Mosquito Bar along with Zoe and JK for a few drinks. It turned onto a bit of a rowdy affair before we all left (or got kicked out) for some much needed sleep. 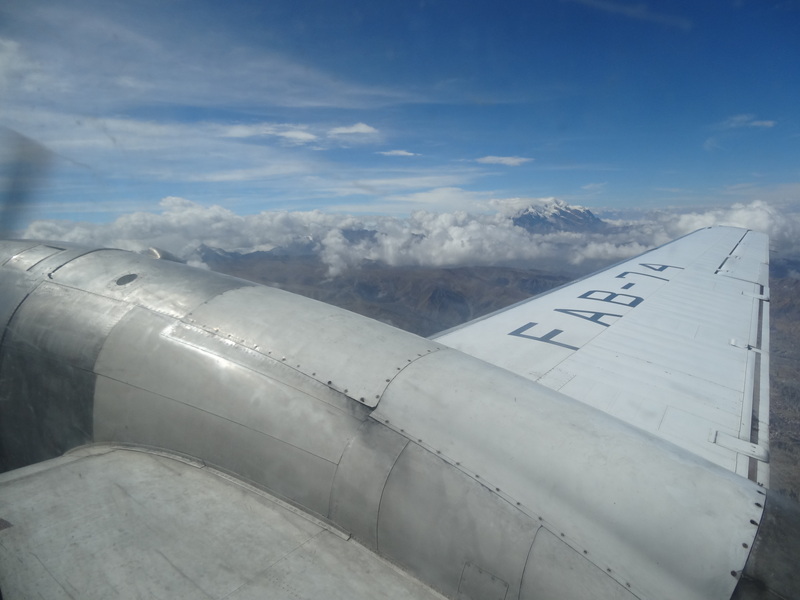 The next day we had our return flight to La Paz, or so we thought. The airport is tiny, and doesn’t really have a departure building. Instead we were all congregated on the edge of the runway waiting for our plane to arrive. As it came in to land it suddenly veered off the runway almost hitting a group on people on the grass verge. Everyone watching was pretty shocked as it looked like it was very close to being a serious accident. The plane slowly came to a stop next to us, and there was some sort of fluid leaking from one of the engines. The locals didn’t seemed too concerned about this, and just left us to play cards under the wings so we could shield ourselves from the sun. Eventually after a couple of hours of trying to either fix the problem or organise another flight, we were told that the flight was cancelled. I think we were all quite relieved by this, as the thought of getting back on that plane was a bit worrying. So instead we decided to stay another two nights and enjoy the sunshine. Before we could even get off of the tarmac though, the bus back to town actually broke down as well, and we all had to get out and push. It was ridiculous, but kind of summed up Bolivia. 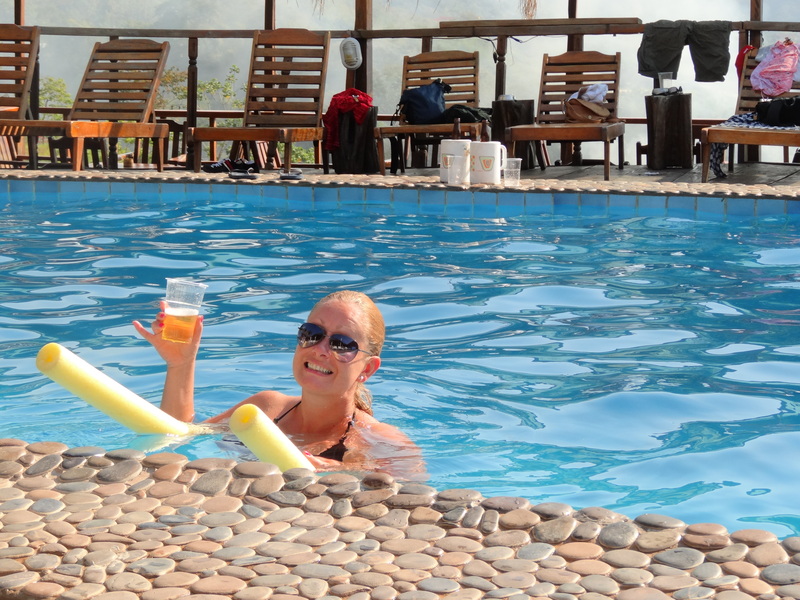 We found a bar that had a nice swimming pool, and spent our extra day catching up on some sun. We knew the next day was going to be busy because as soon as we got to La Paz, we had an overnight bus booked to take us to Sucre. This actually turned into a very stressful day. First of all our flight was over an hour late leaving, then it took an age to get our bags off the plane. Then as we got a cab back to our hotel to pick up our bags it was diverted as roads were closed. I also had to run to the ticket office to pick up our bus tickets. When we got into another cab to take us to the bus station, as he went to leave the battery died, and we both had to get out and push the cab, again. Eventually we got to the station with about 15 minutes to spare, but the attendant wouldn’t let us put our bags on the bus. Instead he told us to wait outside the bus and he would come back. Well we waited there until the bus driver closed the door and started driving away. I was shouting at him to stop but he just ignored me, so instead I stood in front of the bus to stop it from leaving. Eventually the attendant came back and took our bags, and we got aboard. We had to laugh about it, but it was not the easiest day of travelling…another one to add to the list.